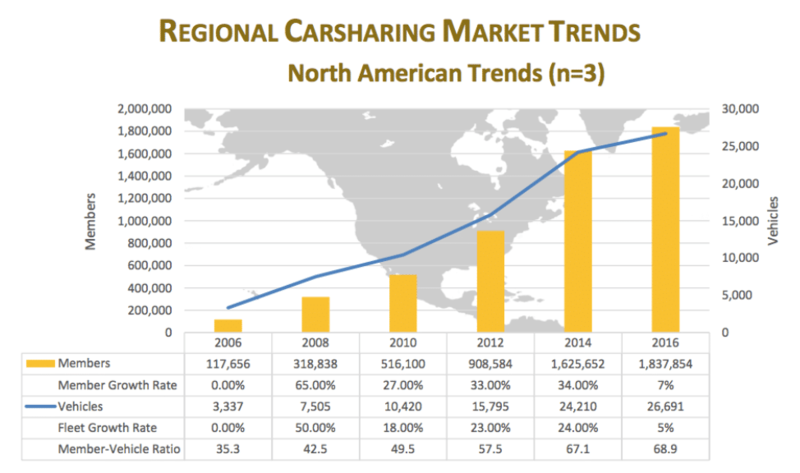 In this carsharing market analysis written by our Founder, Sandra Phillips, you will learn about key trends and growth patterns from carsharing markets around the world during 2017 and some new developments in 2018 and growth trends for the next 7 years. The latest carsharing industry analysis provided by UC Berkley’s TSRC show that in October 2016 carsharing was operational on all continents except Antarctica. TSRC estimated that there were carsharing organizations in 2,095 cities worldwide. Fleet size was globally over 157,000 vehicles and about 15 million members are registered. 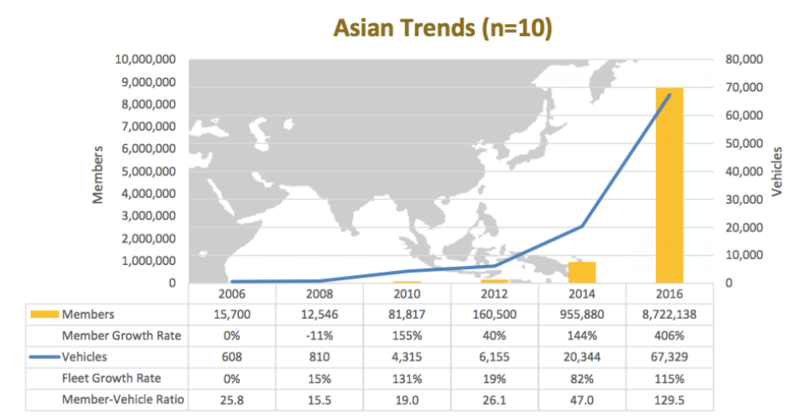 Asia is by far the largest carsharing region with over 40% of all carsharing vehicles operating there. 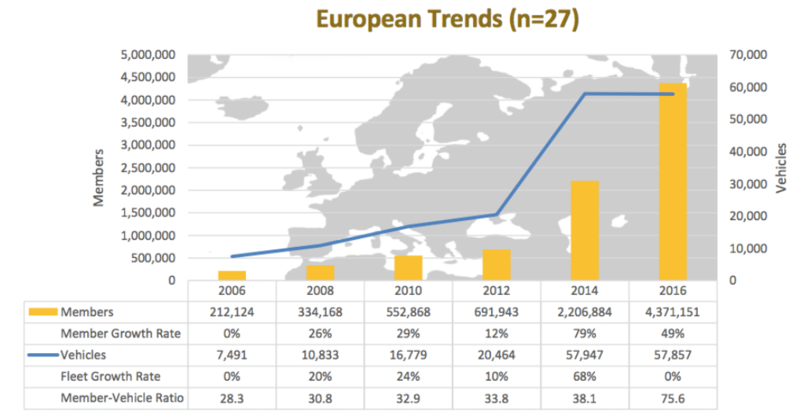 Europe is the second largest carsharing market with 37% of the global fleet deployed in that region. Station-based/Round-trip carsharing (like Zipcar, Communauto or Maven) still account for the majority of all fleets while free-floating (such as car2go, Gig or DriveNow) is a growing segment. Estimates on the split between station-based and free-floating vary slightly depending on which research we have looked at, but generally station-based hovers between 74 – 83% and free-floating between 17 – 26%. In Oceania, however, the relation is reversed: almost 80% of vehicles there were part of a free-floating fleet. An important point to note is that free-floating has seen tremendous growth on the membership as well as fleet side over the past few years. Overall membership for free-floating has increased by 76% (!) which we at movmi attribute to the low barrier of entry. Free-floating providers in general do not charge recurring membership fees but are setup as pay-as-you-go models. Peer-to-peer fleets and membership has also experienced tremendous growth in the past years. Susan Shaheen’s team has found that between January 2016 and January 2017 the fleet has increased by 80% and membership has more than doubled. Current forecasts by various different consulting agencies (GMI, Frost & Sullivan, Report Buyer or McKinsey) all predict market growth for 2025: fleet size will increase almost 4x and be at around 427,000. Membership overall will increase 5x and about 36 million people will be subscribed to one or multiple carsharing services. Daimler was the first organization to offer free-floating carsharing world wide and on a global scale. It was founded in 2008 and currently offers service in 26 cities, the majority in North America (42%) and Europe (54%) and 1 city in China (4%). car2go used to run an additional 11 cities that were all shut down for different reasons between 2014 and 2016. car2go’s total fleet size is just under 14,000 vehicles and almost twice as big as the next biggest competitor: BMW’s DriveNow/ReachNow program. Three of the European cities are all-electric: Stockholm, Madrid and Stuttgart all have enough infrastructure to sustain an all electric free-floating fleet. Competitors such as EVO have since entered the market, which influenced car2go to offer more, larger vehicle types than its Smart Fortwo. Depending on the market, the fleet consists of Smart Fortwo, Smart ForFour, A- and B-class as well as CLA and GLA. BMW was the second car manufacturer that invested in carsharing, in particular in a B2C free-floating program. In Europe BMW’s program is called DriveNow, in North America ReachNow. The main difference is the technology stack supporting each of the regions, the North American operations is powered by Ridecell whereas Europe runs on Sixt’s platform. Combined DriveNow/ReachNow offer over 7,600 vehicles in 14 cities: the majority in Europe (only Seattle and Portland are operated in North America). ReachNow used to operate in Brooklyn but closed that city in May 2018 because of high operational costs (vehicle damage). DriveNow was founded in 2011 and 6 years later they announced that they have 1 million members signed up for the program. Interestingly enough, Daimler and BMW have agreed to combine their mobility services in April 2018. The decision is pending the examination and approval by the responsible competition authorities but if approved both parties will hold a 50% stake in the joint-venture. The new organization will focus on providing service in car-sharing, ride-hailing, parking, charging and multimodality. The main goal is to become the leading provider of mobility services, especially to be competitive with well-backed competitors such as Uber or Didi. The two groups will most likely also combine some of their operational efforts for cost-savings. Maven is a new station-based initiative launched in 2016 and backed by General Motors. Maven is noteworthy because they have already expanded to 10 cities in the US and launched their first Canadian city in February 2018. Being a station-based provider, Maven’s fleet launches are much smaller than their free-floating competitors. For instance, Maven launched with only 40 vehicles in Toronto. Having said that Maven’s model has huge potential especially for large, very densely populated cities with a functioning public transit system. Members use the cars to do errands or leave the city, in particular during the summer months. The convenience of Maven’s user experience has allowed Maven to sign up over 15,000 members in its first year of operation in New York. While Maven is nowhere close to the size and scale of the biggest station-based provider Zipcar, we believe that GM offers the financial backing and a strategic vision of how to tie Maven together with other shared mobility services (such as ridehailing) that will grow this carsharing service significantly over the next few years. Peer-to-peer carsharing (P2P) is much more common in the UK, the Netherlands, Germany and other parts of Europe, but it is the fastest growing carsharing business model in the United States. Turo is the biggest of the six P2P providers in North America. Turo, originally operated as RelayRides, allows owners to rent out their vehicles through an online portal or Turo’s app. In 2015 RelayRides rebranded to Turo in an attempt to position itself more as a long-term rental and travel service. The rebranding has been very successful and in 2017 Turo announced that they have 170,000 privately owned vehicles on their platform and four million members. As of 2016 they have expanded outside the United States to Canada and later the same year to the UK. In January 2018, they announced expansion to Germany. Turo has been viewed as one of the hottest transportation startups, f.i. by Forbes in 2015 with a valuation of $311 million. Part of Turo’s success is because they have managed to partner with large car manufacturers such as GM or secure funding from that industry (f.i. Daimler in 2017). The other part is an extremely simple user experience for the owner of the vehicles: there is no hardware installation required (unlike many other P2P providers such as Getaround, Sharoo etc), a smaller commission compared to the competiton (10-35%) that corresponds with the driver’s choice of the amount of Turo insurance coverage they’d like and the ability of the owner to set their own rental prices. In this next section we will be looking at the three major carsharing regions and their growth potential: North America, Europe and Asia-Pacific. This will be followed by a short overview over Latin America and the MEA regions. North America is the third largest carsharing market globally (behind Asia and Europe) and both fleet and membership has grown significantly since 2010. Fleets increased by more than 2.5 times and membership by 3.5 times between 2010 and 2016. While Canada is the smaller market compared to the US, its population is located mainly in metropolitan areas (over 85%) and boasts some of the most vibrant carsharing markets. This is why some CAGR estimates for fleet and members are closer to 20-23%. An example of a flourishing carsharing market is Vancouver: it has four operators (2 station-based and 2 free-floating) and citizens have access to a fleet of almost 3,000 vehicles. 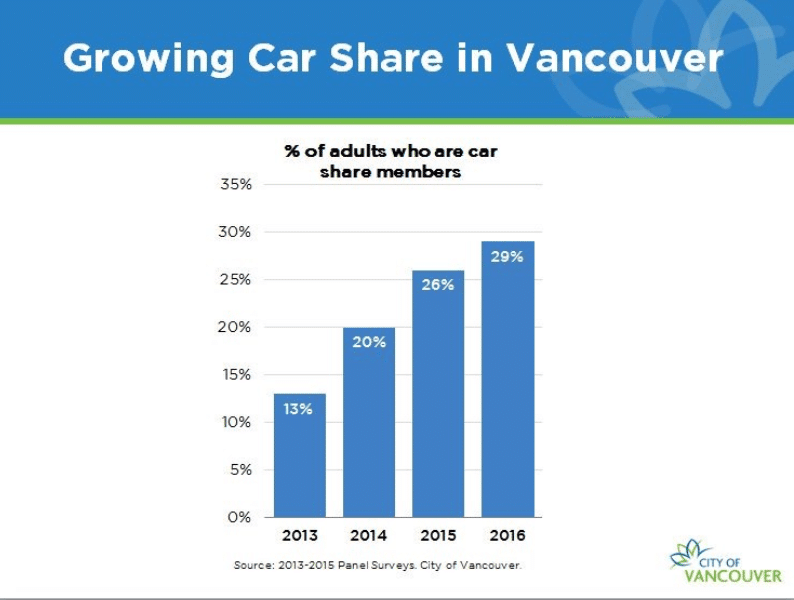 As of 2016, almost 1/3 of Vancouver’s adult population had one or more carsharing memberships. That’s approximately 200,000 people. For both countries, we expect an increase in state and municipal incentives, especially also around programs that encourage electric and carsharing in lower income neighbourhoods or more rural areas. In fact, last month (April 2018) the City of Los Angeles in partnership with French Bolloré group has launched an all-electric carsharing operations where vehicles are strategically parked in low income neighbourhoods. The company expects to have 100 vehicles available at 40 locations by the end of the year, and to triple in size by 2021. Another program, which is currently in BETA stage, is Hui in Hawaii. Hui solves the transportation challenges of Honolulu, a city with less dense public transit infrastructure compared to some of the typical carsharing markets (Paris, London, New York). It’s a partnership between Toyota and a large dealer network (Servco). Using dealers to operate carsharing fleets allows for a unique setup which will create new opportunities in smaller and more rural communities. Europe is the second largest carsharing market globally (behind Asia) partly due to its densely populated cities and partly because the European Union has put a high focus on the adoption of green technologies and reducing GHG emissions. This has resulted in an explosion of operators and fleets. In 2016, 3.5 times as many carsharing vehicles were available to Eureopeans compared to 2010. It also has resulted in an incredible growth of memberships (eight-fold between 2010 and 2016). CAGR estimates of carsharing growth in the UK are between 18-20% for fleet and membership in the next 7 years. Part of this growth has to do with infrastructure improvements for broadband networks and a very unstable economy that results in people looking for alternatives to owning a vehicle. Carplus is a UK based not-for-profit, environmental transport NGO working for accessible shared mobility and has led a number of initiatives in the past several years to promote carsharing. 1. A focus on providing mobility credits for businesses Instead of providing employees with company vehicles, many car clubs offer their vehicles to employees of large corporations. For instance, Ubeeqo, a provider operating in London, offers mobility credits that employees can use when booking carsharing vehicles. 2. MaaS (Mobility as a Service) With more shared mobility providers launching in the UK (carsharing, bikesharing, ridehailing etc), integrating the different services for ease of use for members becomes crucial. As of April 2018, Birmingham is the first UK city offering Whim, a multimodal transportation app, created by the Helsinki-based technology company MaaS Global. MaaS Global is working in partnership with the West Midlands Combined Authority. Estimates for growth for Germany are a little bit higher than the UK (CAGR for fleet and members between 21-23%). This is not surprising knowing that Germany currently is the biggest European carsharing market. At the beginning of 2018, more than 2 million people were subscribed to a carsharing service and more than 677 cities and communities offer a carsharing service (80 more than in 2017). 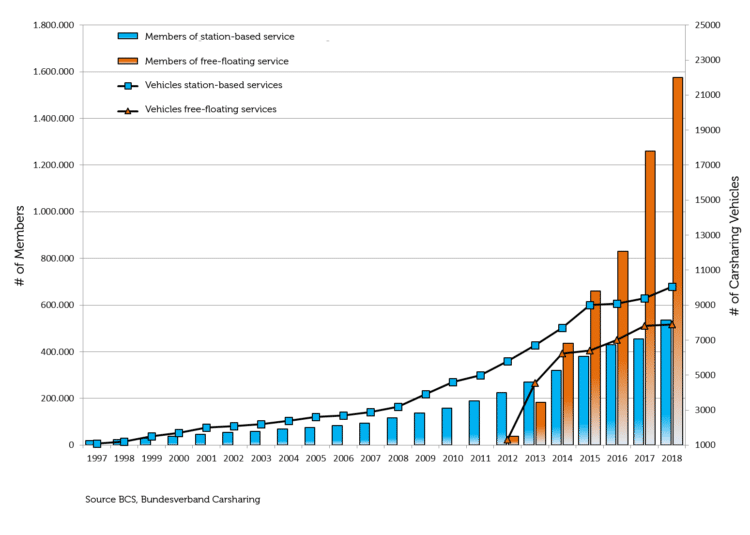 There a few major reasons why Germany has adopted carsharing so quickly. One major factor is because some of the largest car manufacturers introduced their own carsharing offerings (Daimler, BMW). Another major factor included Germany offering a unique regulatory framework that supports clean energy solutions. In 2017 the German Bundestag has approved a so-called Carsharing Law: for the first time regulating the establishment of parking spaces specifically for car-sharing on a Germany-wide basis. The law makes it incredibly easy to obtain public parking spaces for fixed-location provision of car-sharing and allows local authorities to reduce or waive parking fees for car-sharing vehicles. Introducing large-scale electric carsharing fleets is one of the bigger opportunities in Germany with the ongoing investigations into diesel scandals. Currently 10% of German’s carsharing fleets consist of electric vehicles. While this is, in fact, 100 times bigger than for personally owned vehicles, Gunnar Nehrke, President of the German Carsharing Association believes that there is potential for more. However, he also states that support programs and incentives of the German state are needed to increase the economic viability of electric vehicles in carsharing fleets. Growth potential for France is in similar ranges as for Germany, however France is a particularly hot market for peer-to-peer. Drivy is France’s version of Turo and highly successful; in fact, France is the most successful P2P market in all of Europe with over 1 million users. Another large provider of carsharing services in France is Réseau Citiz” who operate in over 80 cities (18 different local providers). It is beneficial to be a local organization in France because the country is particularly strict in its carsharing regulations, especially for free-floating vehicles. They all must be fully electric or at least hybrid vehicles. Similar to Germany the introduction of large-scale electric carsharing fleets is a big opportunity in France. If an operator meets this condition (EV/hybrid fleet), it is very easy for them to obtain the necessary parking permits. However, the challenges are also similar, only cities with sufficient infrastructure are feasible and financially viable for that model. As of 2016, Asia is the largest carsharing market world-wide. Furthermore, the fleet size has more than tripled in only a 2 year period, from 2014 to 2016. Membership is at a staggering 8.7 million, double of European numbers. Rapid industrialization and urbanization were major factors that fueled this growth. In addition to that countries such as Taiwan and India have underdeveloped transportation infrastructure and high air pollution (China). The first means that Asian Pacific countries are undertaking very stringent controls on personal vehicle ownership. The latter is pushing governements in these regions towards using their road network more efficiently and adding more EVs. Combined it provides fertile ground for carsharing which is a more efficient ways of utilizing vehicles. China’s carsharing fleet and membership are poised for more growth. Roland Berger, a German consulting firm that has researched carsharing for years, estimates an annual growth rate of 45% by 2025. Despite this huge growth prediticion, China remains a challenging market to enter, especially for foreign operators. There are several initial conditions to be met to launch a carsharing business in China: none of them are easily achieved, especially in cities with strict license plate restrictions and parking lot shortages. Unsurprisingly, 90% of all carsharing organizations in China are operated locally. Chinese operated carsharing providers can be split into three groups: OEM self-owned, third party backed by OEMs and third party technology companies. For instance Didi Chuxing, China’s biggest ridehailing, AV and transportation AI technology company, has launched electric carsharing services with a dozen car manufacturers (some local, some international). Most of the carshare operators in China rely on government subsidies and exclusive partnerships which help them gain an initial foothold in the market before establishing a more profitable business model. 1. The Chinese government is targeting 2 million EV sales in 2020 and their strategy of incentives as well as restrictions on gasoline-car purchases seems to be paying off: in the first quarter of 2018, roughly half of all global EVs were sold in China. 2. In addition to that China heavily invest into building out electric charing infrastructure. By 2020, the government estimates that 10,000 charging stations will be active. India’s shared transportation industry is not as attractive as China’s and it is also not as well reserached. However, it is also well positioned for growth. Industry experts estimate annual growth rates for fleet and membership base to be around 25%. The main drivers for these changes are the headaches of owning a vehicle and finding parking in metropolises such as Mumbai or Bangalore. The residents are looking for more comfort and convenience while saving costs. The biggest opportunity in India lies in electric ridehailing. All major players in the region (Ola, Uber and Didi) are all heavily investing into electric fleets in an attempt to combat some of the regions Smog problems. Latin America’s carsharing fleet and membership has grown steadily over the past 4 years, however it is far behind the top three markets. 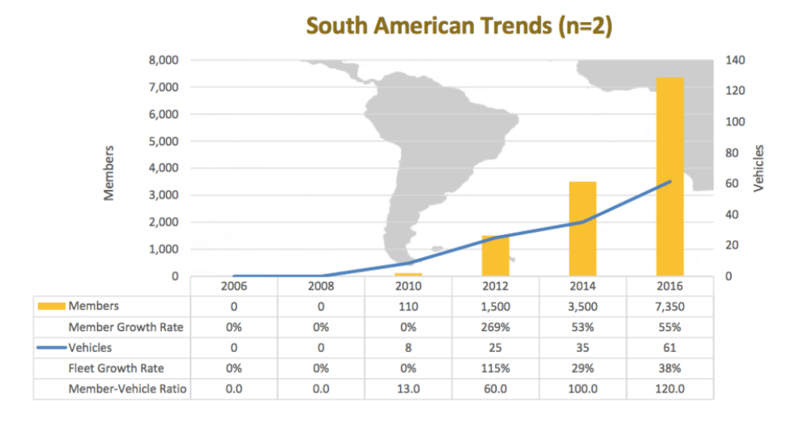 It is interesting to note that in 2016 all providers in South America operated a station-based model, generally a model that shows lower adoption rates than free-floating ones. Brazil and Mexico have extremely densely populated cities and a high rate of urbanization. With these factors, this results in more people needing to commute to and from work which worsens congestion. In addition, many people do not own vehicles letting them have more disposable income (mainly in Mexico) which makes the region fertile for carsharing growth. However, economic issues are abound and currency instability, such as the Argentinan peso dropping rapidly, has deterred many foreign operators to invest in this volatile market. The Middle East and Africa are generally completely neglected by carsharing researchers and growth estimates (if they exist) are in the lower end of the spectrum. Investment from the government in smart transportation (f.i. Next) and an increase in number of inquiries on movmi’s side from this region indicates that experts estimates are most likely too conservative. The United Arab Emirates have experienced significant growth in carsharing since 2016. In January 2017, the Roads and Transport Authority in Dubai announced that it had contracted U Drive and Ekar to operate 200 vehicles for smart rental services. A little bit over a year into operations, both organizations have experienced growth in their membership and fleets. Ekar aims to have 500 to 600 cars on the road by Ramadan, while Udrive is targeting 1,000 by the end of 2018 or start of 2019. Ekar’s membership base is at about 50,000. Part of the success is a high level of technology savviness of UAE consumers, a large portion of the population that is transient and excessive costs of maintaining a vehicle. The increased focus of the Emirate government to create alternative forms of transportation to ease congestion and GHG emission issues also helps with market growth. Another market to keep an eye on is Africa, in particular South Africans seems to have an increased appetite for smart shared mobility solutions to save cost. However only a local operator, Locomute, offers services. The extremely high crime rates means this market will most likely stay on the slow lane for a while longer. So where are the big opportunities in the growing carsharing market? We predict that the three trends outlined below will create more growth for carsharing operators and increase fleet and customer size globally. Governments across the globe are putting regulations and incentives in place to increase electric vehicle usage overall to reduce GHG emissions. Carsharing fleets generally have high interest in adding electric vehicles because it often allows them to gain access to special parking permits or special governemental subsidies. In addition to that carsharing consumers adopt electric vehicles quicker because pricing for EVs or a traditional combustion engine vehicles are the same. They also appreciate the positive impact their choices make on the environment. From an operational perspective, governments, municipalities and utility providers need to invest in large scale charging infastructure coverage if EV carsharing is to become profitable and not dependant on governement grants or subsidies. The European and Chinese markets are ahead in that respect compared to the rest of the world and we expect some lighthouse projects out of these areas. In North America large parts of the US and Canada are sparsely populated and organizations (public transit and private shared mobility operators) are experimenting with different setups of carsharing. Experiments currently include: offering the service through dealership networks, through peer-to-peer carsharing or by subsidizing existing operators (ridehailing or carsharing) to provide service in more rural areas. This makes sense knowing that smaller communities don’t receive the same amount of public transit funding yet still would like to offer their residents the ability to move around easily. We believe there will be more innovative approaches to providing transportation options in cities like Innisfil. From an operational perspective, advances in big data analytics and algorithms for real-time and flexible operations will support this type of disruption of the current status quo. In larger cities that are reaching a state of saturation with several different carsharing providers (especially in Europe but to a smaller extent also in North America), aggregation and integration of the services becomes crucial. Customers do not want to register with several different providers and load multiple apps to find the fastest way from A to B. The increase in competition will create more incentives to partner up and create synergies. Good examples are the BMW/Daimler merger or Uber’s venturing into carsharing/bikesharing in recent months. In addition public transit providers and municipalities are increasingly open to evaluating MaaS options for their citizen. Mobility-as-a-Service, means fully integrated mobility, as well as integrated public transit in even the largest, most bustling cities. The goal is a seamless user experience which could increase the number of people forgoing vehicle ownership because MaaS offers the same convenience and freedom. The jury is still out on who the final MaaS operator and provider will be: it could either be the public transit authority which would ensure transportation equity for everyone. Or it could be the private sector who would certainly be much faster in innovating. While carsharing has grown over the past several years at an increased pace, movmi believes that we’re only at the beginning. The global fleet size is a fraction of all vehicles registered and so is the member base. The international giants such as car2go/DriveNow, Uber or Turo will grow even further and smaller operators will create new solutions for smaller communities, niche markets or demographic segments. “To date, we have only figured out how to create successful carsharing operations for densely populated cities and a very specific user demographic: young professionals with a higher education and an above average income level. However an increased demand in more flexible and affordable mobility options offers new and exciting opportunities for mobility operators,” believes Phillips. Note: This article has not been endorsed or sponsored by any provider or market research firm and there is no affiliation between movmi and any of the mentioned parties.